Would a filter at the faucet is enough to bring you safe water, or should you install a water filtration system for the whole house? Would activated carbon filter work, or is UV treatment a better option? It’s difficult to find an exact answer. The method of filtration and type of water filter you use should be determined based on various criteria. Factors to take into consideration include the biochemical properties of the water, water pressure, the material and specs of the pipe, your budget, your preferences, among other things. All of those differ from household to household. This article aims at introducing to you the most common types of residential water filters. Following that is the popular methods used in water filtration and purification. The pros and cons of each type and each methods will also be discussed, so you will have a better idea of what would be best for your home. Each method has its own advantages and disadvantages. Most of the time, a water filtration system is a combination of 2 or more methods and materials. Activated alumina is made of aluminum oxide (Al2O3), the same substance as sapphire and ruby without the coloring impurities. Activated alumina is designed to remove fluoride, arsenic, and selenium from drinking water. With many pores on its surface, the alumina can reduce up to 99% of fluoride concentrations in the normal fluoridated water. Activated carbon, or activated charcoal, is a form of carbon that has been processed to maximize the number of pores on them. When it is used to treat a liquid, the pollutant molecules are trapped inside these pores. Thanks to its large adsorption surface, activated carbon is very widely employed in removing organic compounds or extracting chlorine from water. You can find this material in most pitcher filters and filter elements in larger household filtration systems. Effective in removing chlorine, sediment, volatile organic compounds (VOCs) and improving the taste and the smell of the treated water. Cannot remove minerals, salts, and dissolved inorganic compounds. Ceramic filters are made of ceramic, which has a lot of small pores on it. As water runs through the filter, anything larger than the pore size is kept outside. Ceramic water filters are sometimes treated with silver to kill bacteria and prevent mold and algae in the water. Reverse osmosis is a method of water filtering in which water is forced through a membrane with small pores. These pores allow water to run through, but keep the contaminants outside. The purified water is then collected while the water with the pollutants is flushed away. Typically bulky as a whole system with pre-filters, post-filters, and reverse osmosis membranes, RO filters are oftentimes quite a big investment. 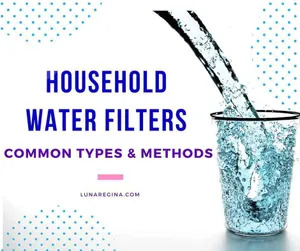 However, thanks to their high effectiveness in removing heavy metals and various harmful chemicals, they are a favorable choice among health-conscious households, especially the more affordable under-sink and countertop filters. UV water purifying systems use light of high frequency to irradiate water through a glass element. As water passes through the element, all living microorganisms in it are killed. Distillation is a process of water purification with very high efficiency. During this process, water is boiled into steam, which is then cooled down to the form of liquid and is collected in a clean container. In the household scale, water distillation is often applied on countertop distillers to make drinking water for small families. Removes most contaminants. Kills bacteria. Very slow. Takes long hours to produce a small amount of pure water. The most frequently seen water filters in American homes. This is probably one of the most common types of water filters, thanks to its low cost and portability. A water filter pitcher typically has 2 parts. At the center of the upper half is a filter filled mostly with activated carbon, where you will pour water in to be treated. The filtered water will drop down to the lower part of the container, and you can pour it out from there. Due to their limited capacity, water filter pitchers are mainly used to purify tap water for drinking and cooking. They’re also a safe and convenient way to get clean water when you’re outdoors, on a camping trip for example. Slow. Confined capacity – you need to pour water in and wait for it to work. As its name suggests, this is a small device you install right on your faucet. It removes the contaminants in the water right before it comes out, leaving you with fresh water for cooking and washing. Faucet water filters are generally inexpensive, making them a popular choice in the households. They’re best at improving the smell and the taste of tap water in areas where the water is relatively already safe and clean. Similar to faucet filter, this is a device you install on your shower head to filter the water for your shower. Sometimes the filter comes with a shower head itself. Filters for shower head are advised for areas where the water contains a rich amount of chlorine and fluoride, which are known to cause dryness and irritations to individuals with sensitive skin. Many users reported they feel reduced hair loss and a smoother skin after the filter is installed in their bathroom. Countertop water filters are a slightly better choice when you want to purify your tap water without having to keep filling and emptying a jug. They are small devices connected to the faucet, purifying water as you turn the tap on. A countertop filter may sometimes come with its own faucet. Countertop filters are small. However, they still do take up some space on your countertop and are thus less favored at households with a narrow/small countertop. An under-sink water filter is typically a water filtration system installed under the sink in your kitchen. It removes bacteria and pollutants, making the water safer to use. Under-sink water filters are usually large, expensive, and are not very portable. They can process a larger amount of water at a much faster rate compared to faucet or countertop devices. Whole house water filter systems are usually seen in households where tap water is not an option. They’re typically installed right at the water tank, connecting to the main pipe, purifying the water before it is distributed to different areas in the house. What kind of water filtration are you using in your home? Does it improve the smell and the taste of your water? Share your experience with us. When I visited my brother in their new home I did find unusual particles with their water. I believe he needs to see this very useful and informative post. I am sure that there is a need for their water to be treated.